Bridal jewelry, such as engagement rings and wedding bands, are typically worn daily, and can appear like they've lost their sparkle if not cleaned on a regular basis. Lotions put film on diamonds and reduce their sparkle. Avoid cooking food or doing dishes with jewelry on. Don't wear diamond jewelry while doing strenuous or rough work. Avoid chlorinated pools and hot tubs or any chemically treated water. Avoid touching diamonds with your fingers, as smudges can affect a diamond's luster and fire. The easiest and safest way to clean diamond jewelry at home is to use soap and warm water. Soak your jewelry in a mix of dish soap and warm water for about 15-minutes. You may use a clean tooth-brush to lightly scrub away any debris. Rinse with fresh clean water. If you have questions, feel free to contact one of our jewelry experts at Jewelry Design Studio, and we will be happy to provide all the information you need. 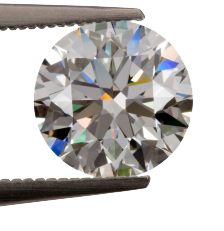 If you would like to have your jewelry professionally cleaned, stop by Jewelry Design Studio for a complimentary cleaning and inspection.